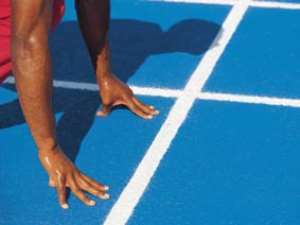 Cape Coast, Feb.10, GNA - Mensah Kane House came first with 101 points in the 56th edition of the athletics competition of Ghana National College, Cape Coast held at the schools sports grounds on Wednesday. Kwesi Plange House took the second position with 92 points, Siwudu Macarthy House came third with 83 points while Afedu House came fourth with 52 points. In the Girls Division, Faustina Daniels House placed first with 57 points followed by Elsie Dadzie House with 43 points while Charlotte Bart Plange House came third with 35 points. Robert Munko of Mensah Kane House was adjudged the best athlete of the competition. He won the triple jump and shot putt events and placed second in the javelin event. Ms Mavies Larbie of Faustina Daniels House was declared the best Girls athlete. She won the 400 metres, 800 metres, 1,500 metres and 3,000 metre races. Prizes and certificates were distributed to deserving athletes.